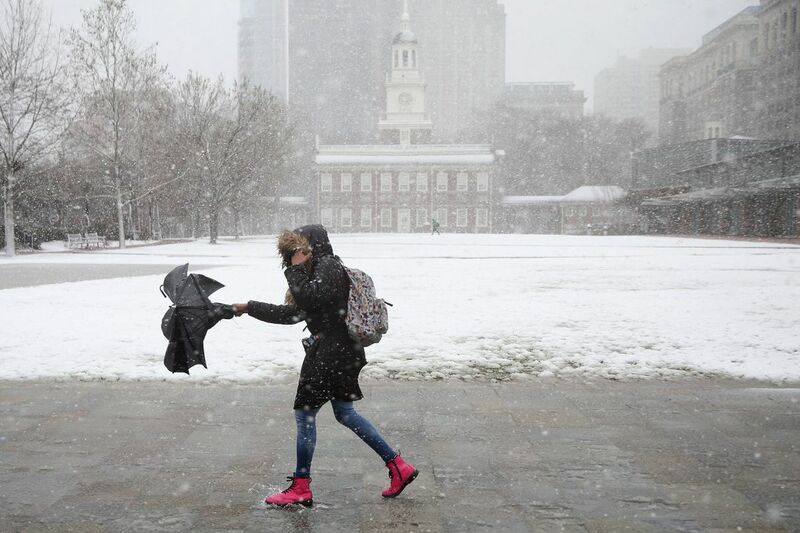 A woman braves the snow and wind along Independence Mall in Center City on Friday. Get ready for more. With more than 20,000 utility customers still without power throughout the region, forecasters are warning that a fresh round of outages appear likely Wednesday, when as much as a foot of wet, weighty snow and another bout of high winds are expected. The storm also is expected to severely disrupt both rush hours Wednesday. "We're not trying to panic people," said Walter Drag, a lead forecaster at the National Weather Service Office in Mount Holly, but "it's going to be big. "It looks to me like we could double the power outages we had last week," he said. The National Weather Service issued this map Tuesday morning. Pink is for Winter Storm Warning. Blue is for Winter Storm Watch. As for those still waiting for the power to come back on, he said, "If they don't have it by Wednesday morning –." Once again, a nor'easter is forecast to blow up off the Atlantic Coast, with precipitation creeping into the region Tuesday evening and continuing as heavy snow on Wednesday. On Tuesday morning, the weather service issued a winter storm warning for Southeast Pennsylvania while keeping South Jersey under a winter storm watch. "Heavy snow expected," the NWS said in issuing the warning. "Total snow accumulations of 7 to 10 inches, with localized amounts up to 13 inches, are expected, especially near and just west of the Interstate 95 corridor and in the hilly areas of southeastern Pennsylvania and northeastern New Jersey." "Travel will be very difficult to impossible, including during both commutes on Wednesday," the NWS warned. "It's going to be a pretty good thump midday and afternoon," said Brian Edwards, a meteorologist with AccuWeather Inc. "We're certainly concerned that you could get a sizable snow." Meteorologists also advised that March might deliver yet more snow after this one. "It's not over yet," Drag said. "Heavy, wet snow will cling to trees and wires, leading once again to power outages and downed trees," the National Weather Service said in its morning briefing Tuesday. National Weather Service snowfall forecast for Wednesday. The winds won't be as extreme as the northerly gales that drove snow to accumulate sideways on Friday, plastering north-facing surfaces and likely contributing to a harvest of downed trees, nor will the winds last as long. But any snow would be heavy, since temperatures will be close to freezing and the snowflakes will be full of water weight, something the region's trees could happily live without about now, along with the people who live and work near them. Compounding it all is the fact that last month was one of the wettest on record in Philadelphia, and the ground has just soaked up the melt from what was the biggest snow of the season in many areas. That would make tree roots all the more vulnerable. This time around, expect north and northwest winds of 15 to 25 mph with gusts to 40, said the National Weather Service, which has issued a winter-storm watch for all of Eastern Pennsylvania and adjacent South and Central New Jersey, with the highest snow amounts expected north and west of the city. "It's a sure thing," Drag said. Minor flooding is expected at the Shore, which wouldn't be as bad as Friday's. Another big difference between the coming storm and last week's: The snow is arriving with notice. Drag said the region's emergency managers have been briefed. Computer models and their human users were ambushed last week as the coastal "bomb" — a rapidly intensifying cyclone — drew in cold air more rapidly and robustly than forecast. Only minimal accumulations had been expected. Driven by ferocious north winds, however, snow became super-glued onto the north sides of tree trunks and their branches. That contributed to the taking down of an astonishing amount of wood, said Paul Meyer, head of the Morris Arboretum. One of the trees the arboretum lost was a Norway maple, on the grounds since at least 1932. Its roots can be traced to a nation that has known winter. It didn't survive. "It snapped 5 feet from the root, which is very unusual," Meyer said. The sideways snow exacerbated the impacts of two more obvious conditions: Gusts of up to 60 mph — "There probably were blizzard-like conditions," said Valerie Meola, a meteorologist at the National Weather Service in Mount Holly — and the sheer weight of the snow that landed atop branches, especially those of mature trees radiating 20 to 50 feet. Had the snow never materialized, the wind alone would have resulted in power outages. But the snow undoubtedly pushed this storm into the Peco hall of fame, with over 600,000 outages. By 11 p.m. Monday, the number of customers without power had been reduced to 26,500, Peco said. Snow could well propel this one to join it, Drag said. The winter revival is the result of dramatic change in upper-air patterns over the Arctic in early February. That set off a chain of events that led to a "blocking" pattern in the north Atlantic Ocean, resulting in a winter outbreak in Western Europe — snow has fallen in Rome and on the British Isles — and last week on the Northeastern United States. Drag said that more storm activity could follow, including this weekend. "Let's pray it doesn't," he said.